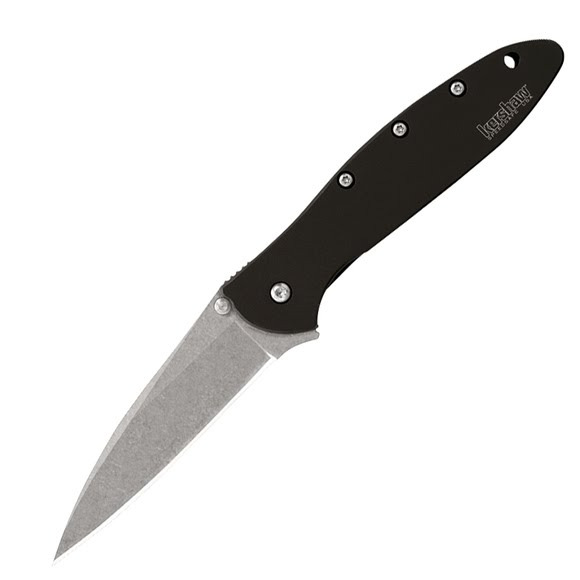 The Kershaw Leek Stonwash Folding Blade features a task-ready 3-inch blade, slim, easy-to-carry design, and cutting versatility. The modified drop-point blade shape makes it a good slicing knife, while the slim tip gives it excellent piercing and detail work capabilities. The Kershaw Leek Stonwash Folding Blade features a task-ready 3-inch blade, slim, easy-to-carry design, and cutting versatility. The modified drop-point blade shape makes it a good slicing knife, while the slim tip gives it excellent piercing and detail work capabilities. Built of Sandvik 14C28N high-performance stainless steel, the Leek&apos;s blade comes razor sharp out of the box and holds its edge, too. We gave it a roughened up, stonewashed finish to hide scratches and for general cool looks. Of course, it also has SpeedSafe assisted opening for fast and easy one-handed opening. Left- or right-handed, a simple pull back on the ambidextrous flipper or push outward on the thumbstud and the Leek&apos;s stonewashed blade is ready to go to work. Locks the blade into position after the blade is deployed. To release the locking liner simply press the spring loaded lock and the blade will easily fold back into the handle.